I’ll alert you to failures in your internet connection and record their exact time and length. This info will help your internet provider troubleshoot the problem – after it helps you convince them it’s not your imagination! 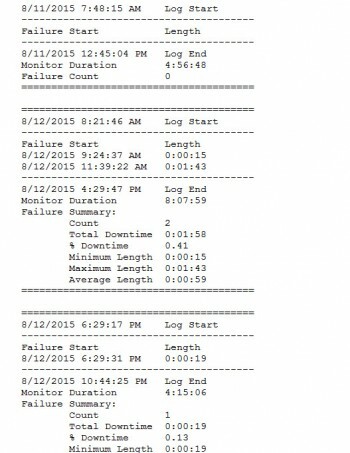 SAVES A LOG with the time and length of each failure in a plain text file. Counts failures and calculates the minimum, maximum, and average lengths. View the log directly from the program or open / edit / print it with any text editor or word processor. 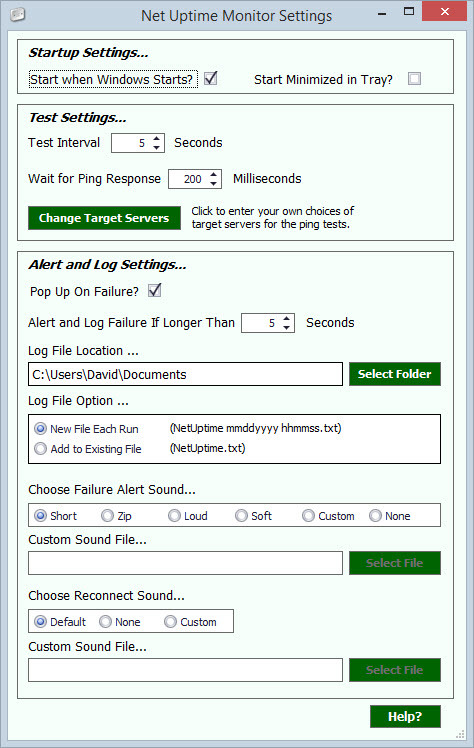 RELIABLE MONITORING – uses three high performance public servers to test internet response. Tests repeat at an interval you choose. If all three servers are unavailable then you know your internet connection is down! No false alarms because one server’s busy. SOUNDS THE “ALARM”! Pick from several sounds that will play when the connection fails. Click the minimize button to hide the program in your system tray – it pops up automatically if there’s a connection failure! COMPLETELY SIMPLE! Just install and run. No complicated setup. Uses very little bandwidth. Won’t slow down the computer. Compatible with all versions of Windows – XP through 10.